We don't cover swimming...at all. But we do cover items that somewhat fall under the Michigan umbrella from time to time, thus no one can argue that what Michael Phelps is doing at the Olympics right now is less than extraordinary. He now has 11 gold medals. More medals than any Olympian in history. At this year's games, he has competed in 5 events, won 5 golds and rewritten 5 world records. That's just incredible. Plus he still has 3 events left to compete in. Here's to the Maize & Blue making is rain in Beijing! 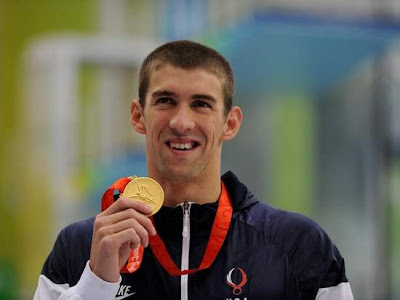 Did Michael Phelps successfully graduate from UM?